The funeral of Theodorik L.Tobing in 1972 in Pematang Siantar, North Sumatra. LMA Tarihoran (then husband of Vera), Vera br. Tobing (eldest grandchild of Theodorik, daughter of his eldest son, Tahi), Helena br. Tobing (youngest daughter and fifth child of Theodorik), Oloan br.Tobing (second daughter and fourth child of Theodorik), Mr Hutagalung (the husband of Oloan). Ernestina br. Hutagalung, Theodorik's widow, is likely to be sitting to very far right of the coffin in front of her family, near to her husband's head. This is the traditional position for the widow of the deceased. There is a suggestion of folds of textiles of someone in this position to the far right of the coffin and just out of shot. The head of Theodorik as he lies in the coffin can just be seen to the far right of the photo in line with Mr Hutagalung. Possibly the two little girls with their backs to the camera are Vera's two younger daughters - Maria (Maria DRT Ambesa) and Bintang - as they were present at the funeral when Maria was 6 and Bintang 2. 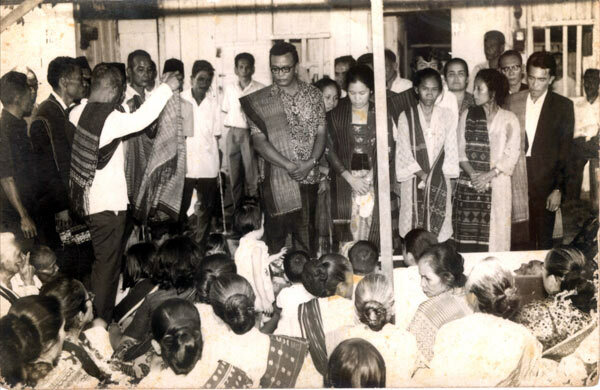 Ulos being worn: The man standing to the left of the photo with his back to the camera has a ragi hotang over his shoulder and is holding up a sibolang which he may be about to place over Theodorik's body in the coffin. L M A Tarihoran has a sibolang over his shoulder and Vera has a surisuri around her shoulders. Helena is wearing over her shoulder the ragi hotang (or huting) namarsimata woven by Ernestina and Oloan is probably wearing the sadum woven by Ernestina over her shoulder - see close-up of both sisters wearing these ulos woven by their mother around 60 years earlier. Parulian, standing behind Helena, may be wearing a bolean or surisuri over his shoulder. The women sitting with their backs to the camera can be seen with a variety of ulos, mainly sadum, over their shoulders.